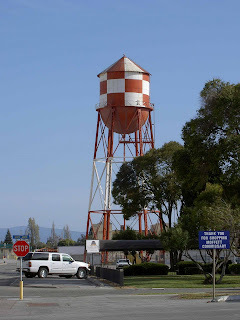 A visible feature on the Moffett Field skyline is the red and white water tower. I've been acquiring old ads and images featuring airships of late, with an eye to decorating our future bar/restaurant space. One that really caught my eye was an advertisement by the Pittsburgh-Des Moines steel company about their new water tank serving 'Uncle Sams dirigibles'. 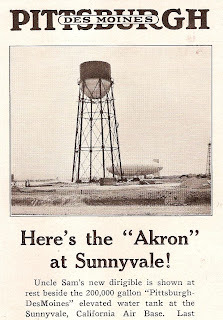 On May 13, 1932, the Akron, sister ship to the Macon, visited the incomplete Sunnyvale Naval Air Station (to become Moffett Field). The PR folks at Pittsburgh-Des Moines captured an image of the Akron with the water tower for an advertisement. They explain that a modern airbase demands "trained man power, strong mooring masts, ample stores of gases, oils, food - and water." And that "this well built tank will guarantee a constant and dependable water supply." I've also found some great adverts for spark plugs, shock absorbers and the like, all using their connection with patriotic airships to sell their wares!